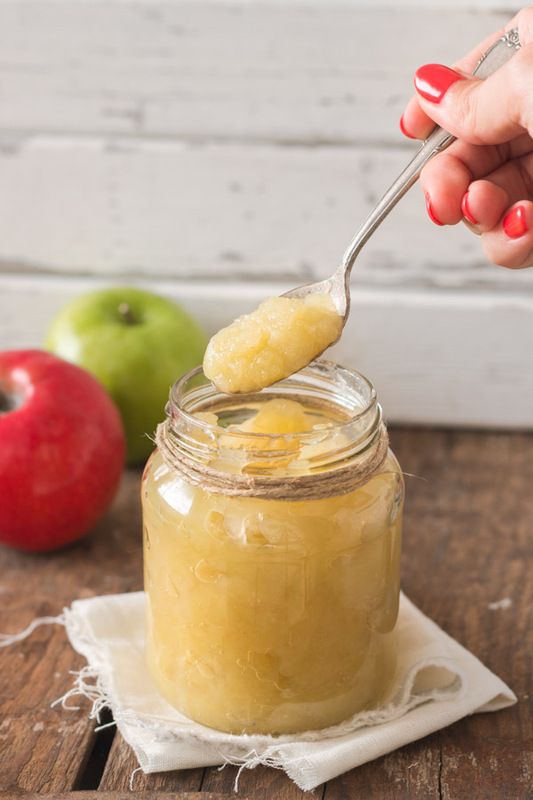 Homemade Applesauce | Pretty. Simple. Sweet. 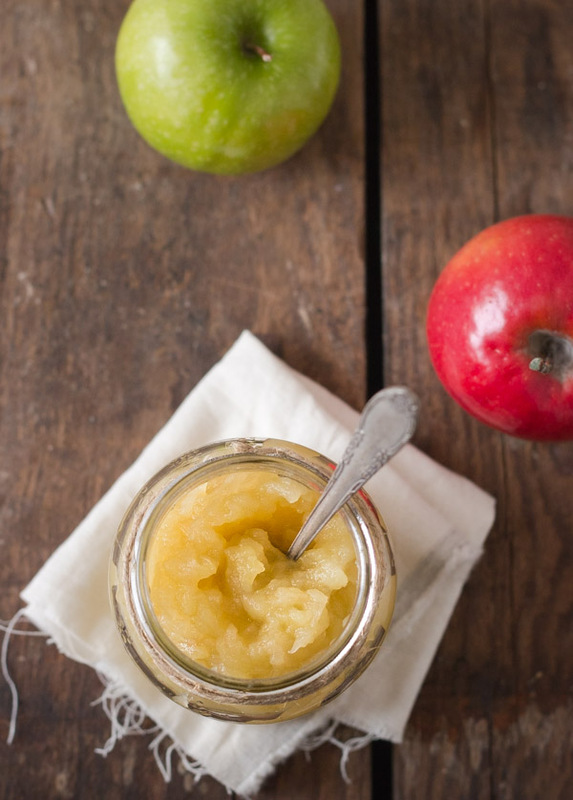 Applesauce is easy and quick to make at home, and only needs a few basic ingredients. You can cook one single type of apple if you like, but for a more complex flavor, I like to use a variety of both sweet and tart apples. 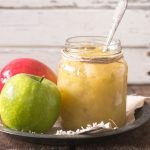 There are so many kinds you can choose from: Granny Smith, Jonathan, Macintosh, Braeburn, Fiji, Jonagold, Pink Lady, Macoun, and more all make delicious homemade applesauce. All you need to do is put the ingredients in a pot and bring to a boil. Then, lower the heat, cover with a lid, and cook for at least 15 minutes, remembering to stir occasionally. 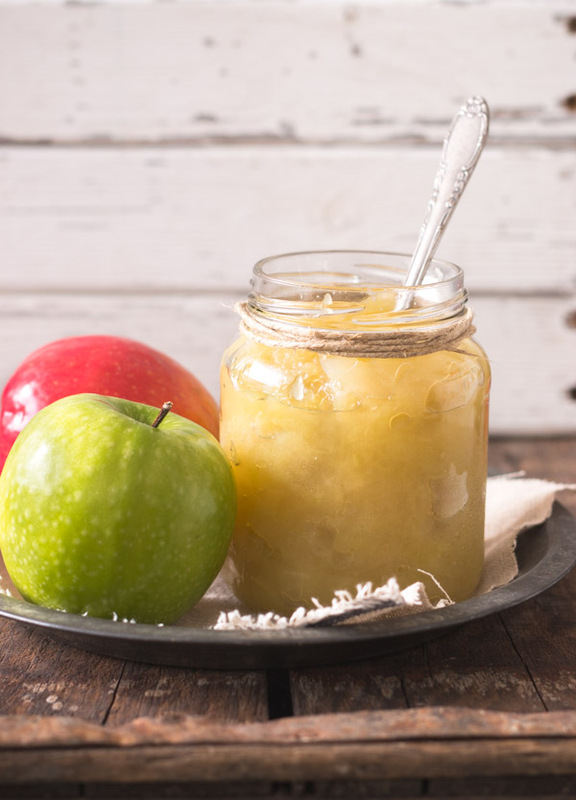 There are no rules or exact amounts when it comes to making an applesauce since it’s all based on personal taste. 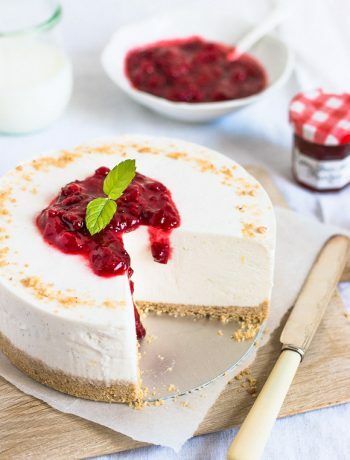 You can use more or less sugar depending on how sweet you want it. A bit of lemon juice helps to slow down oxidation, but it’s optional, and a pinch of salt helps break down the apples. The traditional liquid is water, but if you want even more apple flavor, you can replace it with apple cider or unsweetened apple juice. If the apples are fresh and juicy, you can use less water, down to about 1/3 cup. If they are more on the dry side, you can always add liquid after the apples are already cooked until you get to desired consistency. 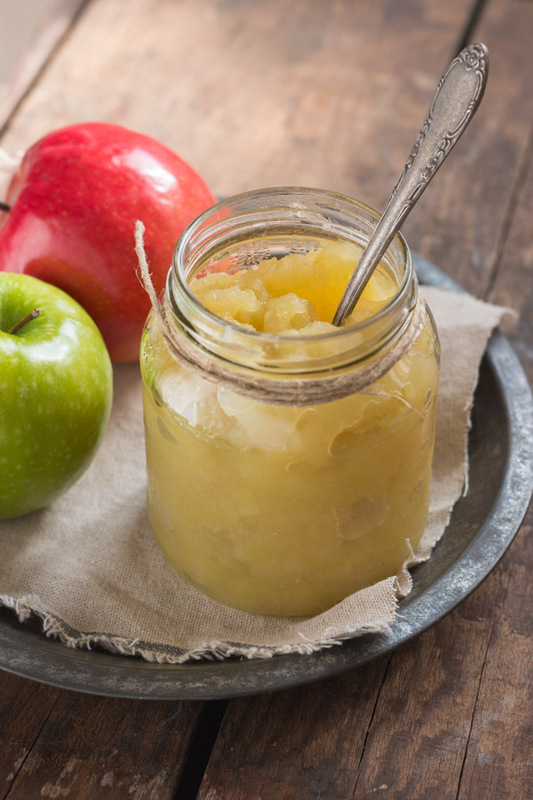 You can flavor the applesauce with many other ingredients. You can cook it with a stick of cinnamon, 1-2 whole cloves, 2 strips of lemon peel, or a small piece of fresh ginger and remove after cooking. You can also add a bit of finely grated lemon zest, lemon juice, or Calvados (apple brandy). Ground spices are also an option. Ground spices and Calvados should be added after cooking. 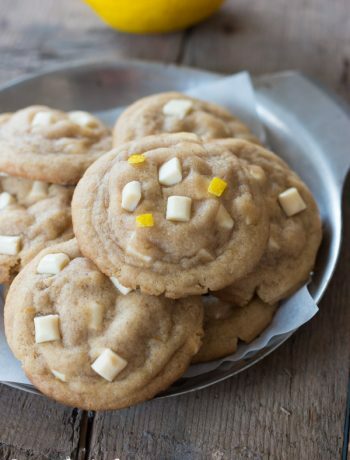 This recipe yields 2 cups. You can easily double it for a larger amount, but if you do, keep in mind to adjust the cooking time accordingly. Cook until the apples are tender and start to break apart. The exact timing is up to you. For a chunkier sauce, cook for around 15 minutes, but for a smooth applesauce, you’ll want to cook for 20-30 minutes. You can also mash the apples after they’re cooked if you feel it’s still too chunky. 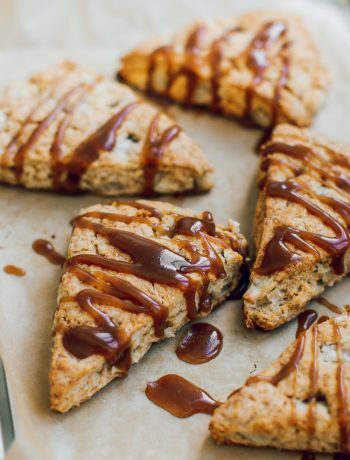 Break them apart using a fork, potato masher, or pastry cutter. For an extremely smooth sauce, you can also use an immersion blender or even a food processor. In a medium pot, place apples, water, lemon juice, salt and sugar and bring to a boil. Reduce heat to medium-low and cover. Allow apples to cook, stirring occasionally until they’re tender and start to break down, about 15-30 minutes depending on how chunky you prefer them. Remove pot from heat. For a slightly chunky applesauce, mash the apples using a potato masher, fork, or pastry cutter. For a smooth applesauce, blend using an immersion blender or food processor. Serve hot, warm, or chilled. 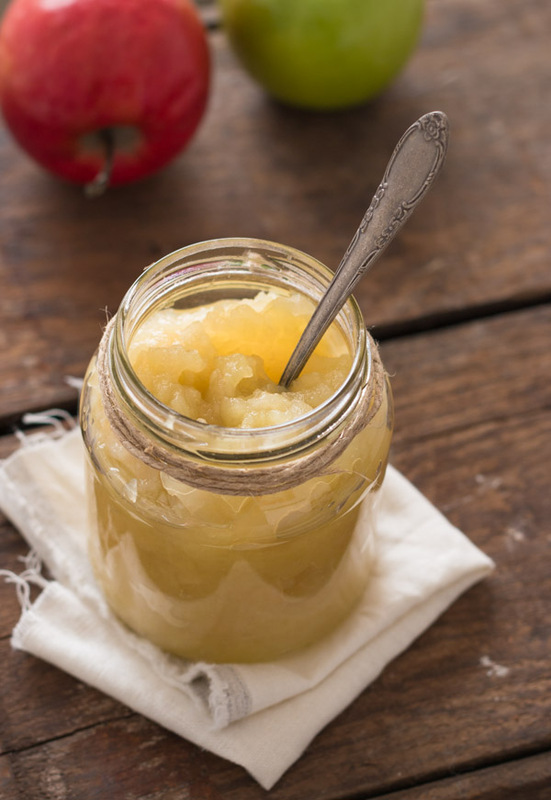 Applesauce will keep for one week in an airtight container in the refrigerator, or for a few months in the freezer. Yum homemade applesauce is the best. Great recipe. Thanks.